Dr. Booth is a Research Associate at the Friday Institute for Educational Innovation and an Adjunct Assistant Professor in the College of Education at North Carolina State University. Dr. Booth’s professional interests center on the development and evaluation of innovative uses of technology to support teaching and learning. Currently, Dr. Booth leads the research for the Connected Educators project funded by the U.S. Department of Education. Dr. Booth is also involved in the evaluation of North Carolina’s implementation of its federal Race to the Top (RttT) grant. 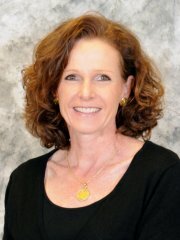 Specifically, her work focuses on the evaluation of online professional development initiatives. Before coming to the Friday Institute, Dr. Booth had extensive experience as a curriculum developer. At the JASON Foundation for Education, Dr. Booth served as Senior Curriculum Developer for online mathematics professional development courses for teachers. Through her work at Education Development Center in Newton, MA, Dr. Booth developed, implemented, and evaluated numerous technology-enhanced curriculum projects and professional development programs. Dr. Booth holds a B.A. in Mathematics from Sweet Briar College; an Ed.M. from the Harvard University Graduate School of Education; and a Ph.D. in Curriculum and Instruction from North Carolina State University. Dr. Booth’s research interests center on the development and evaluation of innovative uses of technology to support teaching and learning. Her current focus is on developing methods and tools for studying online social learning landscapes. Booth, S. E. (2012). Cultivating knowledge sharing and trust in online communities for educators. Journal of Educational Computing Research, 47(1), 1-31. Booth, S. E. (2011). Cultivating knowledge sharing and trust in online communities for educators: a multiple case study. Unpublished doctoral dissertation, North Carolina State University, Raleigh, NC. Kellogg, S., Corn, J., Booth, S., & Marks, J. (2012). Race to the top online professional development evaluation: Interim report. Raleigh, NC: The Friday Institute for Educational Innovation. Office of Educational Technology. (2011). Online communities of practice for educators: Planning and Implmentation Guide.